Following the requirements set by the New York SAFE Act, Adams Arms introduces a product line of New York compliant rifles, uppers, and barrels. Following the 2013 ruling of the New York SAFE Act that redefined the term "Assault Weapon," Adams Arms developed a line of products that are compliant with the act and do not require mandatory registration as defined under the act. 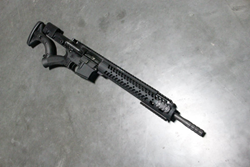 The product line includes compliant rifles, uppers, and a unique Melonited barrel from VooDoo Innovations. The barrel, which is not legally able to include threading or a muzzle device in New York, features a contoured look to mimic that of a flash hider or compensator. "We designed the New York compliant rifles to be able to service our customers in more restrictive states, while maintaining our high standard of quality. We combined the tried and true components of Adams Arms' standard line of piston-driven AR15s with a special stock, grip, and barrel to allow those customers to enjoy their 2nd amendment rights. The barrel is my favorite part of the new rifle, giving customers unmatched accuracy, reliability, with a custom look," says Adams Arms Manager of Sales Operations, Tyler McCutcheon. Choose from two available 16" rifles with either the Samson Free Float rail or a lighter MOE Forend, both with the Adams Arms piston system. Also available for those who want to build their own compliant rifle are the Mid MOE upper, Mid Tactical Evo upper, as well as the contoured VooDoo Barrel. These products can be found at http://www.adamsarms.net. Adams Arms is known for developing cutting edge products that meet the needs of their customers. They are dedicated to providing high quality components that improve performance and minimize maintenance costs for the AR-15/M-16 rifle platforms. All products are made in the USA and come with a life-time warranty. For more information, visit http://www.adamsarms.net.